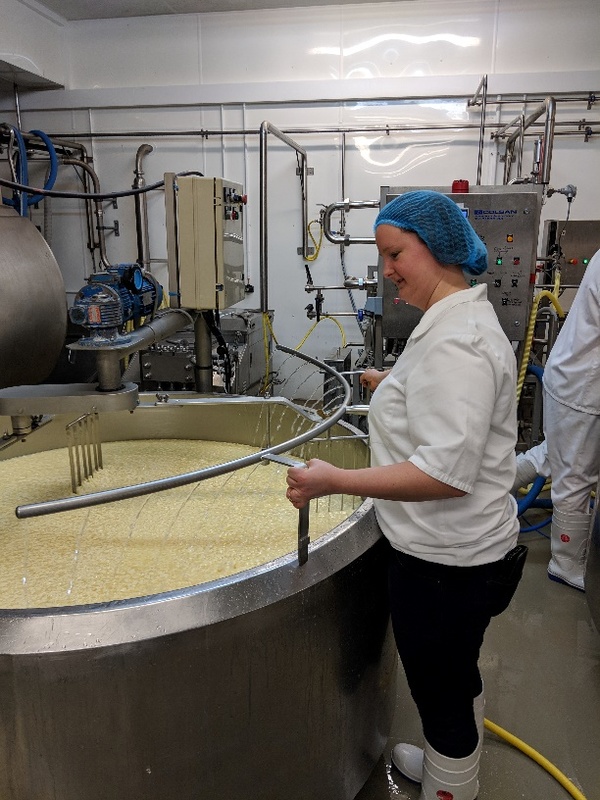 Annie and I recently went to Alsop and Walker to learn more about their business and to see some cheese being made! We took the train on Thursday night and stayed overnight ready for an early start in the morning. We started the morning just after 7am at Plumpton College where Arthur and his team make most of their hard cheeses - they have use of the college’s facilities in exchange for Arthur teaching the students a few times a month. He makes a few of his cheeses especially for Plumpton including Woodside Red which was one of the cheeses we saw in production. Our day started with tasting each of the cheeses he produces, including Mayfield Swiss and Lord London and stories about each, such as that Lord London was originally created for the 2012 Olympics. It is made using 2300 litres of milk which turn into only 14 cheeses! The starter cultures and rennet are added to the warm, pasteurised milk and left to set for around half an hour. The set of the gel is then tested by running a knife through the curd and seeing how it lifts up and how well it holds its shape. The curds are then cut using a set of wires attached to arms that rotate over the vat for about 15 minutes. 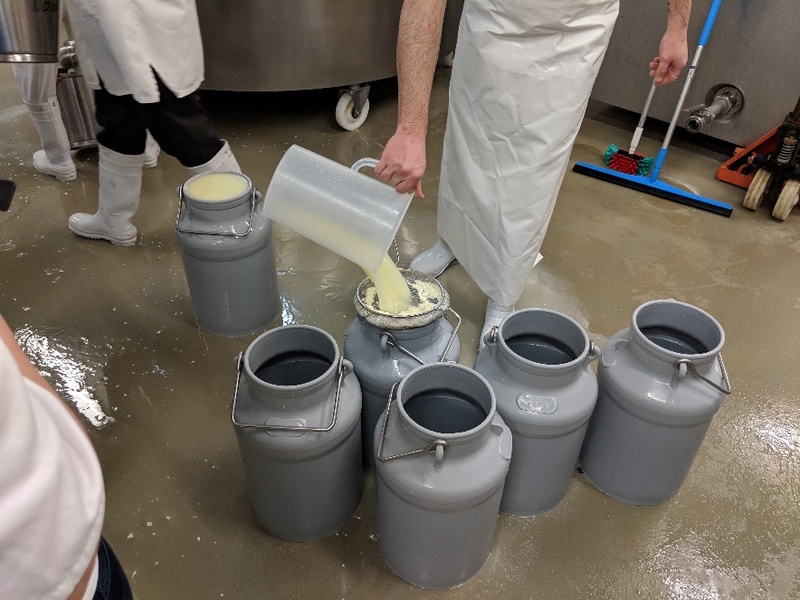 After the curds are cut, they drain out about 20% of the whey and replace it with hot water to wash the curds, raising the temperature of the vat to about 30 degrees Celsius. Curd washing started in the Alps as a way to heat the curds without setting fire to the wooden vats they originally used. It was traditionally done to lower acidity and improve the texture of the finished cheese. 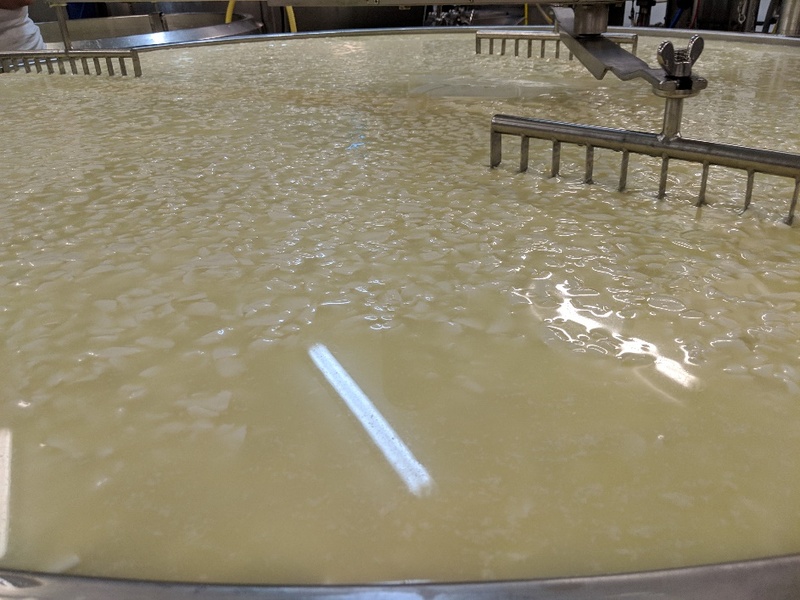 After the curd has been washed, they then move it over to one side of the vat using a metal barrier and drain off enough whey so that the curds start to become visible. 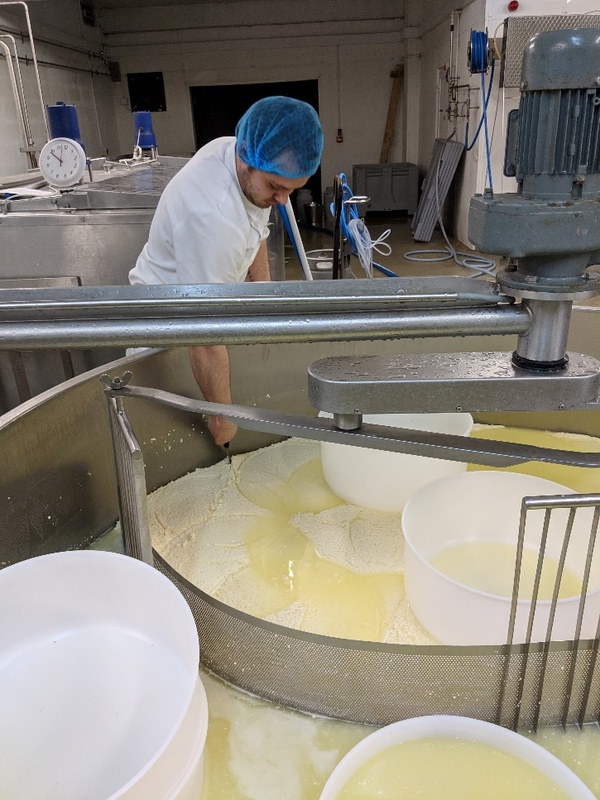 The curds are then moved into the moulds and pressed. They weigh about 30kg each at this point. After an hour and a half of gentle pressure the cheeses are flipped and returned to the press for a further 90 minutes. 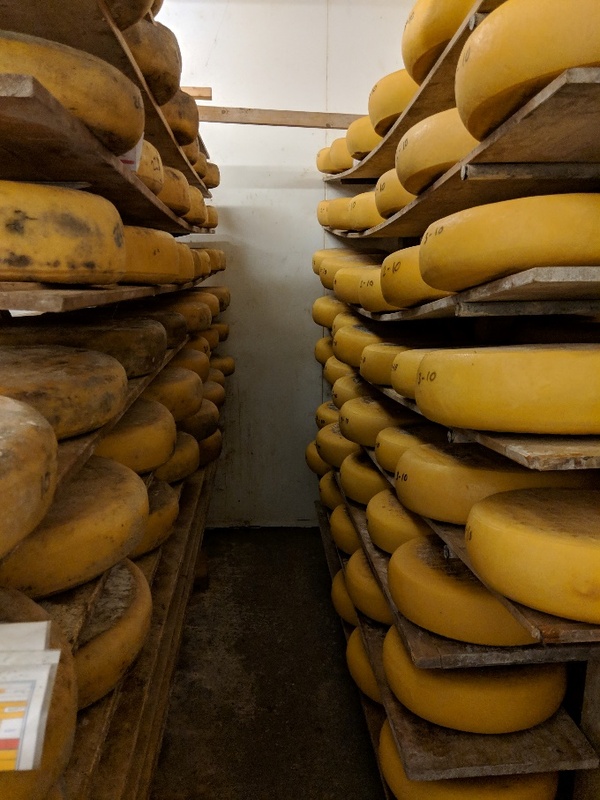 The cheeses are then floated in a brine solution for 3 days while their pH drops before being moved to the maturing rooms and aged for 5-6 months. A product that Arthur is currently developing, is butter made using the leftover whey. Cream is separated from the whey using a centrifuge. There’s about a 1% yield and it took over an hour to create the cream needed for the four blocks of butter we made! If they scale up the process, they will be using a centrifuge with a much larger capacity. The resulting butter was very creamy and delicious but very labour intensive! Our day ended with a tour of the facilities at Five Ashes - the company’s original site - bought from a friend who used to make cheese there but decided to move back to South Africa for some warmth! Five Ashes comprises a series of barns, one for making the soft and blue cheeses, two for maturing / cold rooms and the other an office and staff area. We had a great time with Arthur and his team and found the whole day fascinating.